Concentrated Raspberry, Rhubarb and Orange Blossom Flavoured Soft Drink with Sugar and Sweetener. 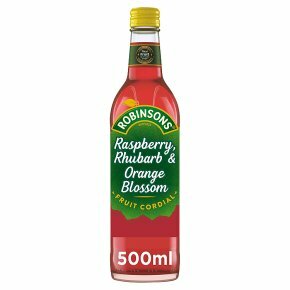 Robinsons used its expertise to create this beautiful combination of Raspberry, Rhubarb & Orange Blossom. Our berries and rhubarb are handpicked and then pressed into juice. Perfectly paired with orange blossom for a floral hint. Sweetened from natural sources with no artificial colours or flavourings, with real fruit in every drop. Best served with ice and sparkling water Shake well.